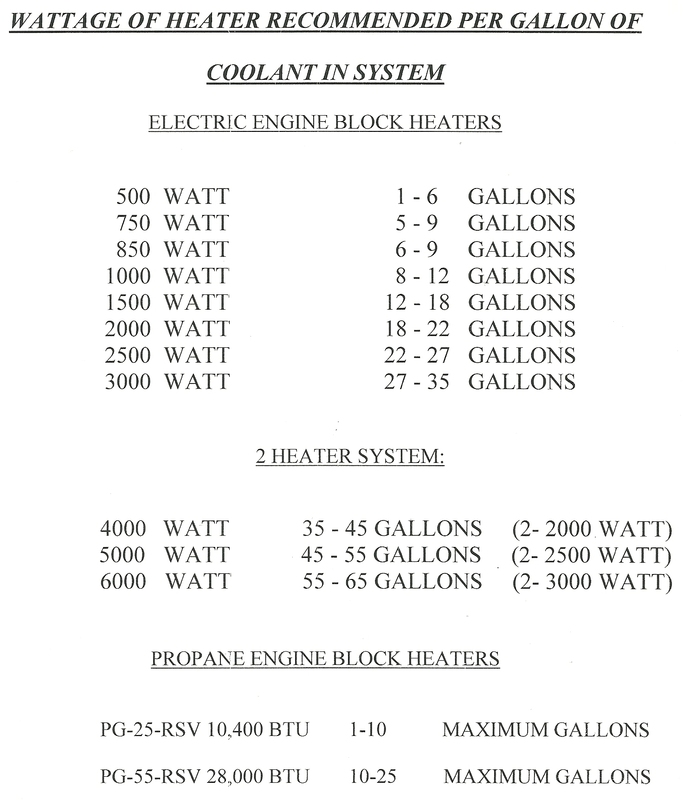 Utilizing an engine block heater assists with the starting of your engine. This maintains a uniform temperature of your engine to prevent "cold starts". This provides easier starting of the engine keeping the engine ready for emergency operations as well as other types of applications. 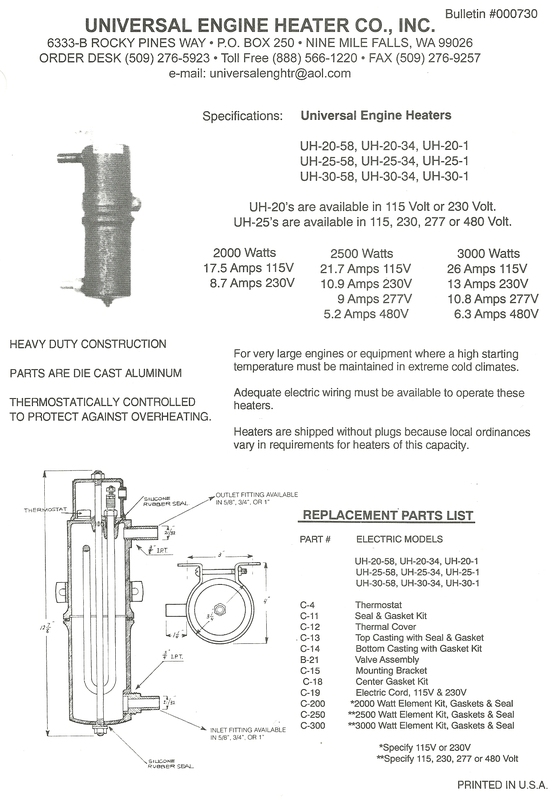 Gemco II Engine Block Heater for heavy duty use. Cold starts can be harmful to your engine and keeping the engine warm helps provide lubrication to other parts of the engine as well as helping to extend the life of the engine and those other parts. Universal Engine Heater prewired with the adjustable thermostat. Question : What is the difference between an "M" model and an "R" model ? The only differences between the "M" model and the "R" model is that the "M" model has a 15 amp safety thermostat vs the "R" model has a 25 amp thermostat. The "M" model has a round plastic check valve in the bottom inlet valve and comes with a T-fitting, (for systems with a cab heater for example), and the "R" model does not. We recommend using the "R" model on standby generators due to the 25 amp thermostat which is better in situations where there might be a power surge and using the "M" models for use on vehicle or heavy equipment applications. Everything else is the same and they are both tank type engine block heaters. Question: When is a 59T used? For applications on a generator or another application where the engine block heater is plugged in 24/7 we have a 59-T adjustable thermostat. This is a separate unit wired to the engine block heater. This thermostat can be set between 90 and 150 degrees F, (32 and 66 degrees C). This keeps the engine block heater from running all the time as the engine block heater has a safety thermostat which will shut off the heater when it reaches 210 degrees F, (98 degrees C). Your coolant will be maintained at the desired temperature you require using the 59T adjustable thermostat. The 59-T is available in 5/8", 3/4" and 1" port sizes. The 59-T can be used with all of our engine block heaters. 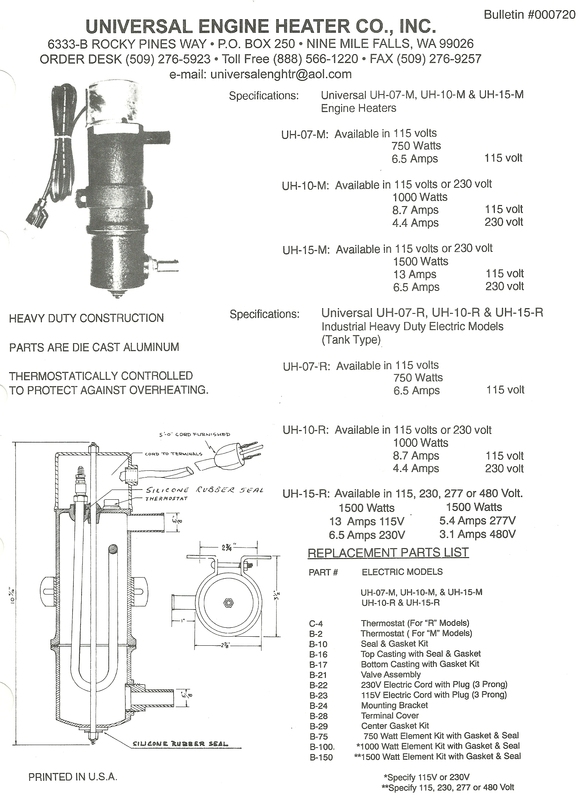 Question: What type of antifreeze should I use with a Universal Engine Heater ? Only NON OIL BASED antifreeze should be used in a Universal Engine Heater. Oil based antifreeze will bake on the element and burn up the engine heater. Prestone is an example of a non oil based antifreeze. 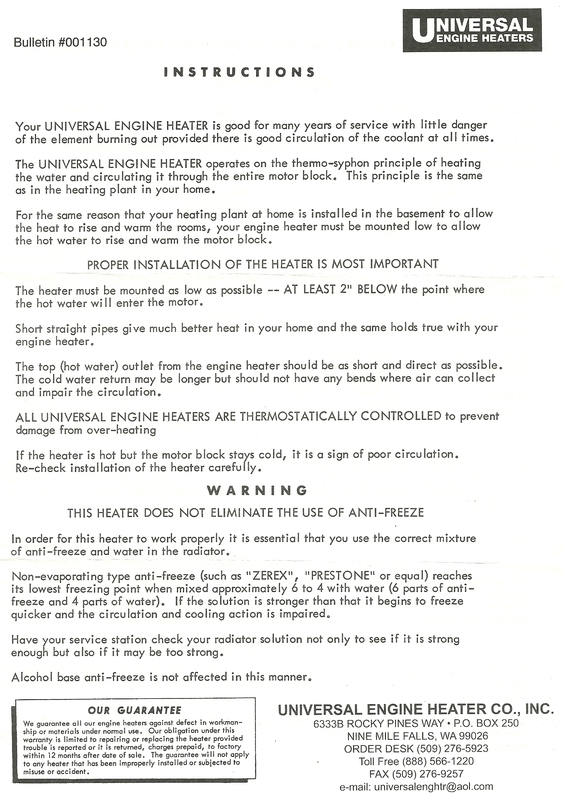 For information on how to properly install the Universal Engine Heater please see the Instruction Bulletin above, Bulletin # 001130. Please also feel free to contact us with any technical and/or troubleshooting problems to speak with our technical staff for a solution.